Alliance Films release. Photo by: Alan Markfield. The second half of the movie finds young Joe crashing in the barn of a single mother. Sara (Emily Blunt) is very independent and very country-minded. She lives on her own and defends her young, and slightly bizarre, son with her own gun. She doesn’t trust Joe but he needs to be hidden and mended. And she wouldn’t be one of the better love interests of the genre if she didn’t do just that. Emily Blunt as "Sara" in the action thriller LOOPER, an Alliance Films release. Most people liked the first half or the second half, finding the film itself to be very disjointed. I thought the two halves actually fit well together, it’s just not an interesting enough story overall so it’s hard to care whether we sit down for an off-centre romantic drama or go on the run for some time-travelling action. The worst part is around the time the two halves come together when we see how different the young Joe and the old Joe are. Character studies are interesting when we see how much someone can evolve over the course of their lives. But the 30 year evolution of Joe took place in around 3 minutes with jumps in time and place. Joseph Gordon-Levitt plays Joe for the first 10 years of the montage as a fairly indifferent, damaged young man and then suddenly as Bruce Willis falls in love and cleans up his life for the next 20 years. Surely there would be a better way to portray that. Bruce Willis as "Joe" in the action thriller LOOPER, an Alliance Films release. It’s an action movie, and for that genre it has a good style and a decent narrative, but don’t turn it into something better than it is. 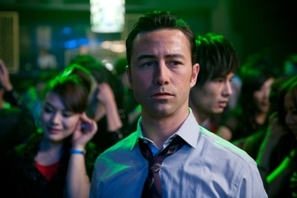 “Looper” is average at best and is not throught-provoking.